Welcome to One Sweet Deal AZ. 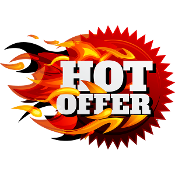 We are adding new offers weekly, so make sure to check out this link on a regular basis to get the best deals before they sell out. These deals are so hot, they are smoking hot. All items are over 60% off. Gift cards contain a balance and work like a debit card. You can use part of the balance or all of it during your visit. In addition to your purchase, gift cards CAN be used for tax and gratuity (unless otherwise stated). Gift certificates can NOT be used for tax & gratuity during your visit. In addition, you can not receive change back from your purchase. Most vendors only permit one certificate per table per visit to be used. Call the vendor for specific details. Gift certificates can NOT be used for tax & gratuity during your visit. In addition, you can not receive change back from your purchase. Most vendors only permit one certificate per table per visit to be used.